The Bachelor of Fashion Design is unique within the higher education system of Macao and will train professionals towards a higher education degree, prepared to develop creative ideas and solutions that are original, innovative and attentive to the multiple challenges of a large and fast changing industry. The Bachelor of Fashion Design was designed considering a diagnostic of requirements and critical facets within: the current socio-cultural developments derived from the convergence of east and west; the most recent technological innovations; the advent of new design materials; the new trends in aesthetics; and the paradigm shifts in the social and productive reality of this industry. This programme will prepare students for professional excellence in fashion and business. Students will explore fashion drawing, colour theory, the complete garment-making process, including professional draping and sewing techniques; computer-aided design (CAD) and will learn to develop design ideas from concept to production as well as fashion business. The Bachelor of Fashion Design aims to foster professionals with their own creative vision prepared to take place in the challenging fashion industry. Students should have a strong interest in Fashion Design and Textiles. A portfolio of creative work is valued for application to the programme. 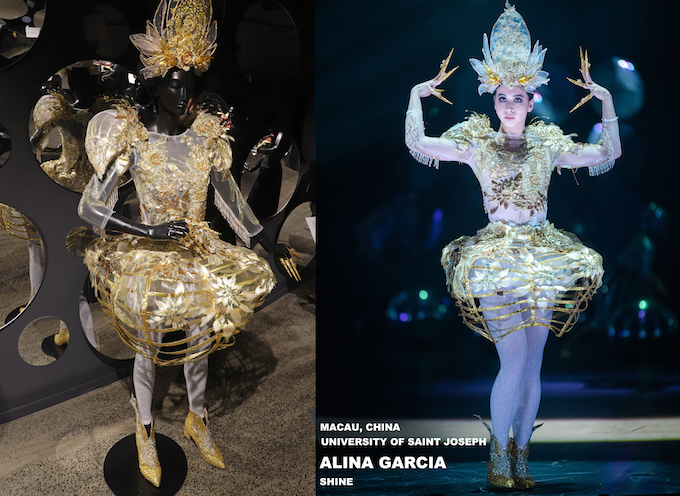 Macao has a long-standing tradition in the textile and fashion industry that has shifted from manufacturing to a creative design paradigm. The University of Saint Joseph is proud to introduce the Bachelor of Fashion Design as unique program within the higher education system of Macau, fostering development of this area, by training professionals with a Higher Education Degree, prepared to develop creative ideas and solutions that are original, innovative and grounded in the multicultural tradition of Macao. This program is established with the collaboration of reendowed Fashion Design Center in Macao – CPTTM (Macao Productivity and Technology Transfer Center) and integrated in the vibrant community of Designers, Architects, and Media Producer at the USJ’s Faculty of Creative Industries. The aesthetic quality of drawing resides in the need to choose, decide, project, hide and underline details, searching for a process or an idea. The abstraction capacity allows recording an idea as well as a communication medium. Its practice is so intuitive and ordinary that, its relevance most of times is consider as secondary. The constant drawing practice will make a strong contribution to new approaches in the creative process as witnessed in the sketchbooks, diagrams and sketches. This activity most of times is a tool that precedes others, such as Painting, Sculpture, Design, Architecture as well as many other disciplines in Science and Engineering. Drawing is essential for training specific, visual, perceptual ways of thinking. This module aims to contribute for critical and consolidation of individual projects of each student; Valuing experimental methodologies associated to projects; Complement the work on the module and other curriculum areas; Confront and discuss different notions of authorship in the field of art and design; develop analytical tools, individual and group and also encourage critical reflection on contemporary artistic practices. The development of thinking skills is fundamental to learning. Students will learn how to develop higher order thinking skills, especially through an appreciation of different philosophic and logic systems and an understanding of important research results from the analysis of human thought processes. In addition, students will learn to reason ethically and morally through readings, discussion of moral dilemmas, and other suitable exercises. They will also learn principled and conceptual thinking and reasoning skills. important concepts of thinking through class and group discussion. Introduction of the study and knowledge, of the basic concepts of the textile from the classification of the different types of fibers, until the notion of textile structure, their recognition and identification as well as their application. In fashion, there is a relationship between events and ambitions of a society and its style of clothing. Fashion is a recurring cycle with modification reflecting these events and ambitions. This class covers the evolution of fashion over the various historical periods, with particular emphasis on the nineteenth and twentieth centuries. Contextualization of times and the study of various historical and cultural periods from pre-history to the present. This course focuses on serach, study and critical analysis of Trend books: Colors, yarns, fabrics, knitwear and shapes; influences - analysis to other sources of information, specific and general; Influent Markets; Brands; Characterization of Consumer target (habits, desires, needs); conception of Environment panels and Mood boards, national and international fairs; Trend organisms; Publications ; Fashion creators and competition. Several projects will be developed. This course aims to provide students with a common space for reflection on art, as part of cultural systems that are changing over time and differ in the various civilizations that originated them. Large themes will be studied, enabling to raise the confrontation and dialogue between students with very different experiences and motivations. The scope of the class covers a long historical period, Middle Age and Renaissance, which resulted in magnificent artistic productions that played a key role in the development of Eastern and Western consciousness. While draping on professional dress forms the student is introduced to translating the three dimensional human form into flat patterns. They will acquire basic knowledge of pattern making, approach to measures tables for men, women and children (Correspondence between sizes of different Countries and International standards). By draping the basic block and developing sleeves the student will also learn about dart positions, draping skirts and collars. A simple garment will be constructed. The module aims to enable students to Plan, develop and design new products and collections of clothing, taking into account market trends and international fashion, sociocultural changes, Technological innovations and use of new materials, quality standards, the functional requirements and the constraints of production. Elements of fashion design related to line, shape, form, colour and texture are also being taught. Basic principles of fashion design concerning silhouettes, balance, proportion, rhythm, harmony and emphasis are fundamental knowledge. Learning the bases from which is developed the apparel design inserted into a project context. Contribute to the accuracy of the technical design of garments for the correct use of the universal language of design associated to fashion design. The intension of this module is for the students to acquire skills for the representation of any garment, with graphic quality, respecting the universal code clothing; recognize the technical basic shapes, having regard to their particularities; dominate representation of several volumes; observe and represent, with technical accuracy, garments already made. Provide the conceptual tools capable to potentiate the exercise of a critical and informed reflection that having as first object the creation and reception of works of art. Contact with a thematic path historically oriented, which runs through the thinking of some of the main agents of aesthetic reflection of the past and the contemporary, the East and West. Enhance critical autonomy and internalization of intrinsic interdependence between the production dimention and artistic production and conceptual discourse. The interdependence between the privileged world of representations for a given epoch, culture or artist, and how art is conceived, produced and experienced. Integrated learning activities involving all skill areas help students practice and apply the fundamentals of English in a more varied setting and develop more accuracy and control of their spoken and written English. Reading activities promote vocabulary expansion and model accurate structure. Students participate in discussion forums and are introduced to presentation skills for groups and individuals. Logical thinking in both oral and written formats is guided. As well, students are introduced to the five-paragraph essay format and practice writing summative, descriptive and comparative compositions. Students will concentrate on gaining grammatical control of their communication (subject and verb agreement, modal auxiliaries, singular and plural nouns, pronouns, articles, sentence structure, statements, questions, simple and compound sentences, prepositions, gerunds and infinitives, adverbs and adjectives, punctuation, and some complex sentence patterns). At the end of the module, students should be able to write a paragraph without making major grammatical errors. Development of the five-paragraph essay format will continue and students will practice writing compositions that are opinion-based, persuasive and begin to compare literature from different sources. Development will continue in regard to presentation skills and discussion forums. This module provides practice integrating those reading skills necessary for academic success at university. These skills include reading for detail, inferring vocabulary in context, finding main ideas, critical reading, understanding sequence, summarizing, recognizing organization, and outlining. In addition, it emphasizes academic vocabulary. Students are introduced to language skills for research and are expected to apply previously taught presentation skills to give more analytical presentations. In this course students are also introduced to basic components of the research paper: abstract, data analysis and interpretation. This module teaches advanced grammar necessary for academic writing. It includes a review of basic grammar and a detailed study of noun, adjective, and adverb clauses, as well as prepositional, participial, gerund, and infinitive phrases. It will also provide written composition practice. Students will be introduced to the argumentative essay structure including the refutation of counter arguments. Students will engage in more complex discussion forums, debates and participate in organizing public presentations. This module is designed to introduce students to the different fields of science and their social and ethical consequences. It is aimed at students who have no background in science or are non-majors in science. The goal is to give students an overview of what science is and how the different fields of science intersects with everyday life. The course will highlight and encourage discussions on current understandings and research trends in the field of science and how these affect our daily lives. Recent developments in Science relevant to concerns about the nature of life, health and related social issues will be addressed. Through lectures, discussions, debates, research projects, field trips, film-viewing, active-learning activities and workshops, the students will explore such issues as chemistry, stem cell research, pre-implantation genetic diagnosis, genetic engineering/GMOs, forensic DNA, space exploration and energy. organizations as a way to increase both performance and productivity. Knitwear occupies an enormous share of the garment business. In this class, students will understand different type of yarns, their characteristics and assignment, structure of different types of yarn and respective applications. Different knitting techniques by using knitting machines will be taught prior introducing knitwear design concept. A knitwear collection has to be developed and the chosen design is made into a finished sample. This class is designed for students with little or no sewing experience. It includes all the basic techniques needed for garment construction plus the maintenance and use of sewing machines, pressing equipment, dress form, cutting tools and patterns. The study of the human body is the exclusive subject of this course, exploring its visual morphological complexity, as an image itself. Drawing will be the study process in its various strategies, allowing to understand, organize and communicate. Key and relevant studies on the osteology and myology and its expressions on the body surface.Crossing knowledge between old and new anatomy studies, in order to systematize and develop skills on figure drawing . Special focus on proportions, structure and volumetry. This class is specially focused on designing men’s and women’s demin outfits, through practical knowledge; students will learn about Denim History, different knowledge on design motif, manufacturing, washing and finishing techniques for jeanswear as well as their repreentation. An original collection will be designed according to studied theme. Field trip to Jeanswear factory plant will be scheduled toward the term. While learning industry standards students enhance their abilities to draft patterns for ladies’ wear by mastering the flat pattern method. Instruction will be given in manipulating darts, drafting basic style lines, skirts and sleeves. At the same time, operation of sewing machineries and dress making techniques will be mastered and in this class, a one-piece dress with sleeves and collars has to be completed. The course of illustration, provides consolidation of working methods concerning the illustrated image, assumed in an author perspective, by encouraging personnel research to the research an own calligraphy. A space for reflection, where the illustrated image will be strong part in construction of a visual sequence, this being linear or fragmented. Aim to identify the social and cultural contexts where the illustrated picture star in its narrative universe. Will be articulated illustrated contemporary images with contact points embedded in the history and evolution of the image. In the sequence of Human Figure I, this course will deepen the knowledge of Human body proportions and volumetric through study of partial structures. Structures and functions - Drawings Studies on the head, hands and feet, trunk, upper and lower limbs. Between static and movement - visual analysis and comprehension. Knowledge of textiles is vital to the understanding and selection of their use in the fashion industry. This class deals with the study of textiles including their characteristics, functional purposes, and care. Fibers, yarns, constructions methods, finishes and various types of textile designs and printing techniques are covered. Field trips to textile mill or fabric manufacturer will be scheduled throughout the term. In this course, we aimed analyze the concepts of culture, showing the field of cultural anthropology in their epistemological purposes, topics and research practices. Special attention is given to issues of human, biological and cultural diversity in understanding the relationships between different social groups today. Training and analysis of various ethnographic examples, with a special focus on Southeast Asia and mainly on China, will provide students a framework for reading the global world in which we live in. Students will learn and apply a variety of public presentation techniques useful for both individual presentations as well as participation in group discussions. An important aspect of the module is that it uses an active learning process whereby students learn a new skill and put it into practice. By the end of the module students will possess a number of public speaking strategies that will help them to prepare any range of public presentations, including proposals, as well as have the opportunity to participate in seminar organization and implementation. The primary aim of this module is to assist students in preparing themselves for the type of writing required for themes, essay examinations, term papers, and lengthy reports. The principles of rhetorical organization and development are thoroughly presented within the context of each student's language and cultural background. Students will engage in problem solving and idea development through the combination of independent investigation, and consultation with peers. Students will practice the process, purposes, and strategies of persuasive and explanatory writing. Students read and discuss works by both professional and student writers and explore techniques of argument and persuasion in writing a series of 5-6 essays. The module stresses revision, relies on frequent workshops of student writing, and aims finally to sharpen the student's ability to use evidence in a reasonable, convincing way. This is an advanced interdisciplinary writing course module emphasizing critical reading and thinking, argumentative writing, library research, and documentation of sources in an academic setting. Practice and study of selected rhetorics of inquiry (for example, historical, cultural, empirical, and ethnographic) employed in academic disciplines, preparing students for different systems of writing in their academic lives. Throughout this course, students will: significantly improve their academic writing; develop an understanding of how members of a particular discipline conceive of and engage in the rhetorical practices of that discipline; demonstrate understanding of the key conversations, the forms, and the conventions of writing in a particular discipline; gain experience in the construction of knowledge within a discipline and practice using its discourse; read critically and analyze rhetorically writings from a particular discipline and use those lenses to frame their own discourses; write in the different forms and styles of a particular discipline; and develop techniques for conducting research on the Internet and with other electronic databases. This module introduces students to drama as an art form, and as part of the module students participate in a theatrical/drama production. As well as devising, rehearsing and presenting a group performance, students also gain awareness and confidence with their bodies. Different Eastern and Western drama and gesture traditions are considered, and recorded performances are reviewed and critiqued. Students will study and explore the history, geography, culture, religion, architecture, urban development, economy, politics, arts, diversions and everyday life of Macau, through lectures, readings, fieldwork and public communication sessions. Special emphasis will be placed on Macau's relations with surrounding regions. The main aim of this module is to support students in examining, evaluating and developing their own knowledge about Macau through critical engagement with a wide range of information sources. For students, the module will also represent an opportunity to further develop their reasoning ability, creativity, communication skills (through a variety of media) and their cooperative working capability. context of Graphic Design will be investigated. This class is specially focused on classic women’s wear retail chain store, they will research through practical knowledge and group project. Students will learn how to plan the sequence of design for presentation with the awareness in both creative and practical aspects. Enabling them work well and communicate effectively within the fashion industry. An original collection will be designed for the local market and the chosen designs are made into finished samples. Upon completion of Pattern and Garment Making 1, students will be taught to draft flat pattern and techniques for making of ladies’ pants with different waist band, zipper closure and pockets. In the class, classic ladies’ pants have to be made. Students will research the area of children’s wear in current fashion trends and the attitudes toward them. An original collection is designed for the local market, for either boys or girls. The chosen design is made into a finished sample as the student continues to learn design interpretation through fabric design, flat pattern making and garment sewing. New skills relating to the development of a tailored jacket are explored by each student. Patten constructions and making techniques are executed. Students develop a group of designs suitable to tailoring techniques and select fabrics for the design. Then the students execute their “best” designed jacket. This module aims to provide students with the appropriate knowledge base of the origin of the accessories industry and its place in the history of fashion and the advanced knowledge to create an innovative collection of accessories from design concepts to finished product through a supportive and professional environment. Also provide students with the ability to identify design concepts and the needs of the accessories market, and to use the appropriate technology and assembly techniques for accessories. Students will develop critical and creative thinking skills via written, oral and visual presentations and will be supported in their advanced training of the latest technology used in the accessories design industry. In this course we aim to give skills to the students to develop an understanding of the relationship between ethical questions and the different social forms that structure social interaction. Thus our object will not be to apply the ethical reasoning schemas of philosophy to social questions, but, instead we will explore the distinctive ways in which the Sociology have framed and conceptualized ethical questions, and their relevance to contemporary ethical conundrums. This module introduces students to technologic textiles materials and sources of inspiration for artistic design practice. Students will develop knowledge of technologic textile, explore and evaluate current textile technologies, gain a basic understanding of textile composition and incorporate this knowledge of textile composition and manipulation into their own fashion creations. Knowledge and skills gained from completing this paper will be applied throughout the following design, production and costume projects. Introduction to basic Portuguese with stress on oral drill and pronunciation. This course will focus on personal information. Continuation of Portuguese I, introduction to basic Portuguese in context, and will focus on people and objects. This course is the continuation of Portuguese II and will focus on public services and immediate needs, such as ordering food in a restaurant or complaining to the doctor. This course will be a continuation of Portuguese III and an introduction to level A2 of CEFR with the introduction to the past forms. Students read and discuss material from such sources as newspapers, journals, contemporary literature, media broadcasts and films. Students complete assignments in areas which focus on a practical application of Mandarin including in business, trade, tourism, education or linguistics. This module covers a variety of modern Chinese literary genres including essays, short stories, biographies, and criticisms. Emphasis will be on reading comprehension and expansion of vocabulary. Class discussions are on some substantive issues related to the readings. The class will introduce essential tools and techniques for the creation, manipulation and production of digital images and audio-visual sequences. Students will learn the fundamental software and hardware required for digital media production. Particular emphasis will be placed on experimentation with introductory montage techniques in photography and narrative techniques in video. Students also experience the critical differences between the transference of still image to moving image. The class will introduce influential artists’ work in digital photography as well as video art and films. This Module introduces Students to tools and methodologies to think and generate Business Models that could be validated by potential Clients that should be discovered and developed. Business Models describe the way of how an organization create, deliver and capture value. So they are at the core of any Entrepreneurship project and are enhanced by Creativity and Innovation. This Module proposes different approaches to promote Creativity, adding value to the process of Business Models Generation. Technology Innovation will be presented as a stronger driver for changes in the markets and to be the basis of powerful Business Models. This class is specially focused on classic Men’s wear retail chain store, they will research through practical knowledge and group project. Students will learn how to plan the sequence of design for presentation with the awareness in both creative and practical aspects. Enabling them work well and communicate effectively within the fashion industry. An original collection will be designed for the local market and the chosen designs are made into finished samples. This class is an introduction to the fundamental development of pattern making for men’s outerwear, casual and tailored clothes. Making technique for Men’s wear will also apply in this class and a finished men’s wear has to be completed towards the end of term. This class is a study of the integration and coordination of fashion product development, promotion strategy, branding, logistic knowledge and pricing activities which direct the flow of social, ethical, legal, economic and international environment. Student will prepare a final project to launch their new fashion brand. In this subject, students will learn to generate ideas using examples from the fashion design world to illustrate concepts, elements and principles of design. This subject will assist students in the development and their understanding of the creative process. Along with design-based explorations, students will also learn processes, attitudes and approaches to the development of critical thinking and problem solving skills that are vital to creative success in the fashion world. This class aims to suport students during their final project as regards pattern and garment making area. In this module they will also explore new ways of making fashions, working out of the traditional way of pattern construction and cutting. It aims to guide students to make unique garment with various shape and special styles in a practical and creative technique easily as well as encourage the discovery of an individual style and/or identity through exploratory and experimental work. As an integral part of their studies, all Bachelor in Fashion Design students must complete 90 hours of work internship with an approved design company before they can graduate. During their internship, students must keep a diary of the work that they do, and examples of their work outputs. Before they can graduate, every undergraduate Bachelor in Fashion Design student is required to present a summary his or her internship work to an academic judging panel for assessment. The portfolio may contain examples of assignment work, tests and examination answer scripts, presentations and project reports, and other work done by the student during his or her studies. Students may attend coaching sessions during their studies to assist them in the preparation of their portfolios.